Mothering has taken on a new meaning for me this year. And it’s not specifically just in the area of preparing to become a mother myself, though it’s definitely part. About a year ago, God began nudging me about my relationships with the mothers in my life. I am the oldest child, born fiercely independent with a natural mothering instinct (read bossy, protective, and at times overly nurturing). During my growing up years, I always wound up the “mom” of my peer group, with little siblings, neighbors, or friends marching behind me. As I entered adulthood, somewhere along the way that fierce independence held me resistant to being mothered by others around me. I was never one to ask for help. In difficult seasons, it felt awkward and stiff to be comforted or nurtured. And I was way more likely to jump off the deep in and learn to swim on my own than take a swimming lesson. Fiercely. Independent. And honestly, it really worked for me for a while. I got a heck of a lot accomplished in my work and in my home because I was only counting on one person: me. Our culture idolizes independence, and I was winning… but I was missing out. Over the next few weeks and months, the words sat with me. I found myself observing girlfriends and family members around mothers and older women. What intrigued me the most was watching strong women my age give control over to mothers in areas where they really didn’t need the help. I watched them speak respect and honor into the room without ever saying a word. Little by little, I experimented with setting my independence aside. In work. At home. On family vacations. Even when I knew exactly what to do next, I forced myself to pause and listen to advice. I learned to let myself need help instead of figuring it out on my own. Through the process, in God’s sweet grace, I am learning to be mothered as a pregnant 29 year old. Not just by my mom and mom-in-law, but by other ladies older and younger, and even the Father himself. I don’t know how you’re going into Mother’s day this year… you may be a tired, happy mama of four or a busy single lady. Maybe you recently lost your sweet mom or you’ve spent so many years raising yourself that you barely pay attention to the holiday. Perhaps you’re one of the few dudes reading this. Whatever the case, my prayer for you and me this year is that God would mother us in the kindest of ways, and that our souls would be open to receiving it. Let’s abandon fierce independence for the riskiest and best replacement. Nothing like a quick “how to” after a heart deep dive, right? But seriously, thanks for hearing me out up there. The beautiful things in life are only as good as the truth that comes with them. Ok, here we go! I’ve always preferred a chill, at home brunch over restaurant crowds for any holiday, but it’s especially true on Mother’s Day. 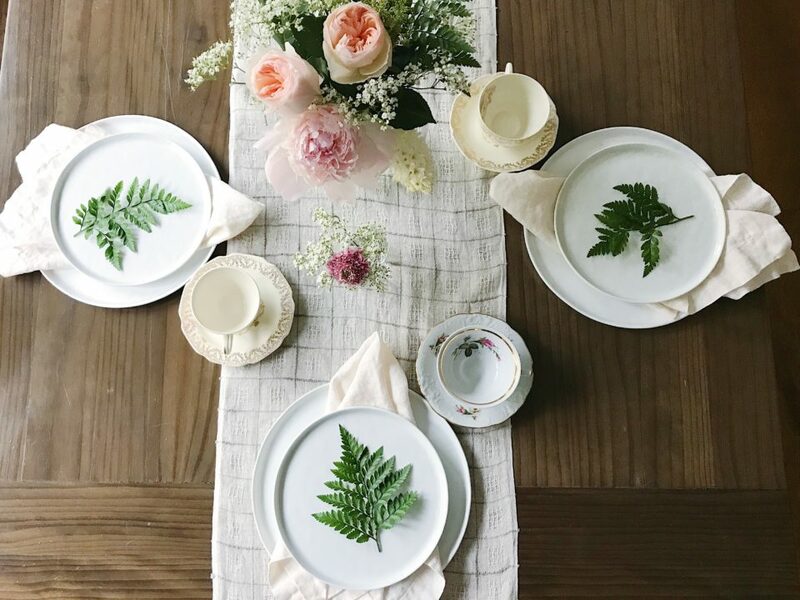 Below are four simple steps for a lovely Mother’s day brunch including free invites, a few of my favorite brunch recipes, table design ideas, and a few thoughtful extras. Step No. 1 Send out the invites. 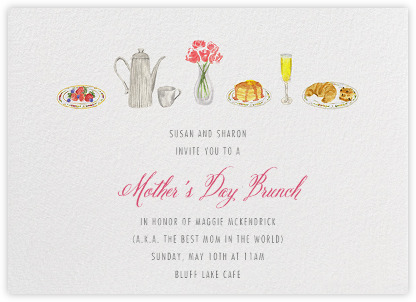 Even if you’re just inviting your closest mom friends or your own mother, sending an invite is essential. 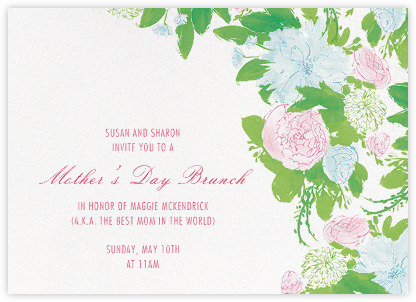 Here are a few free email invites from one of my favorite places to get online invitations, Paperless Post. Not only can you track which guests have received and opened the invite, you can also send a quick message to guests with any reminders before hand. Step No. 2 Set the table. There’s something really special about sitting down for a meal at a beautiful table. 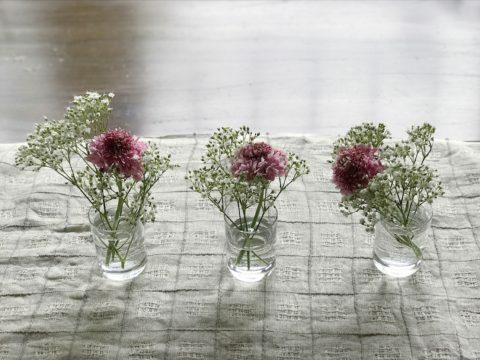 It’s a simple, but profound way to honor your guests. 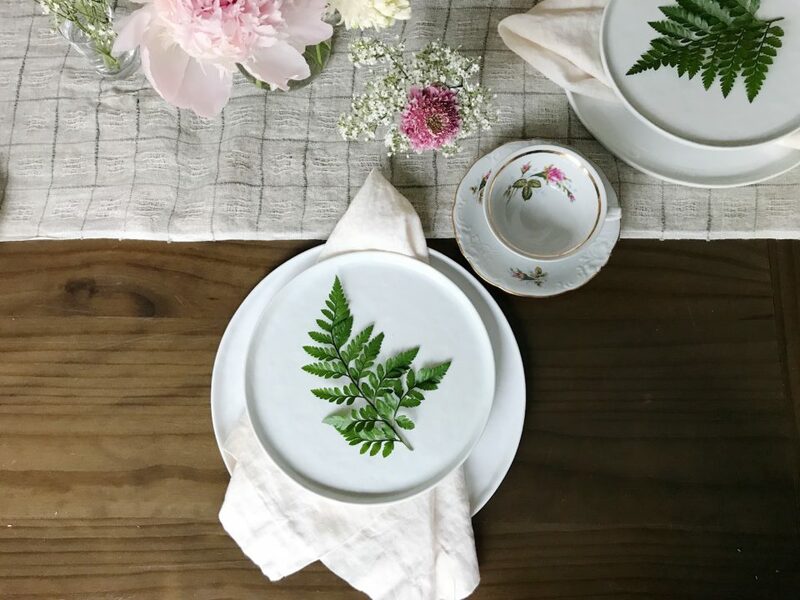 For brunch this year, I dressed up my usual white plates with a fern sprig (extra from the bunch I purchased) and a linen napkin. 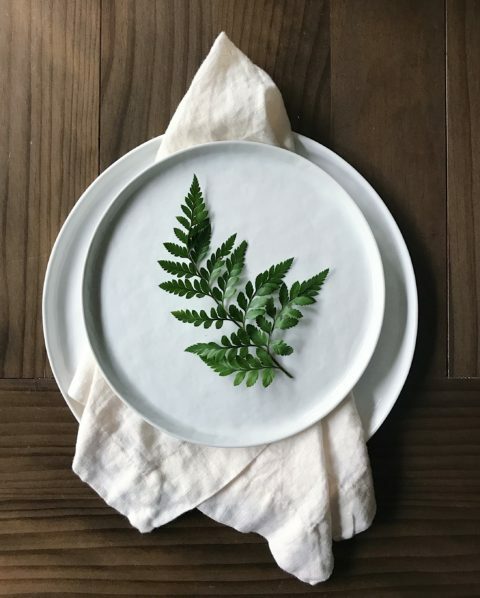 For the same look with your own plates, set the dinner plate down first, then pick up a napkin from the center fold, allowing it to fall into a messy triangle shape. Place a salad plate and simple piece of greenery on top. For the florals, I arranged one short bouquet for the middle of the table, and tiny bouquets for each place setting. 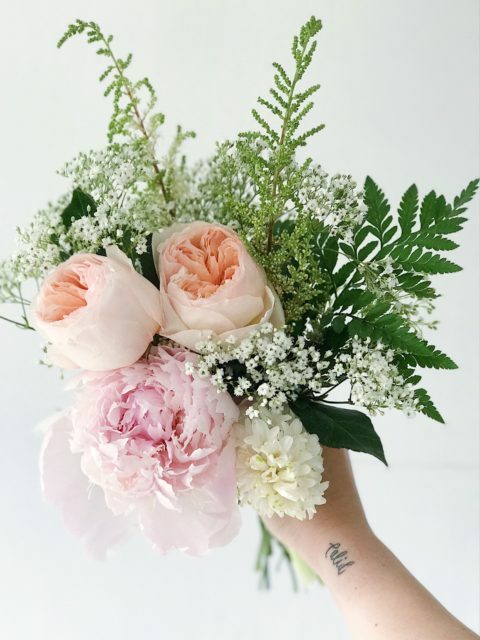 You can generally find good flowers at the grocery store market leading up to Mother’s Day. I also like to visit my local florist the week before and pick out the good stuff before it’s gone. Better yet, forage in your own backyard for wildflowers. Step No. 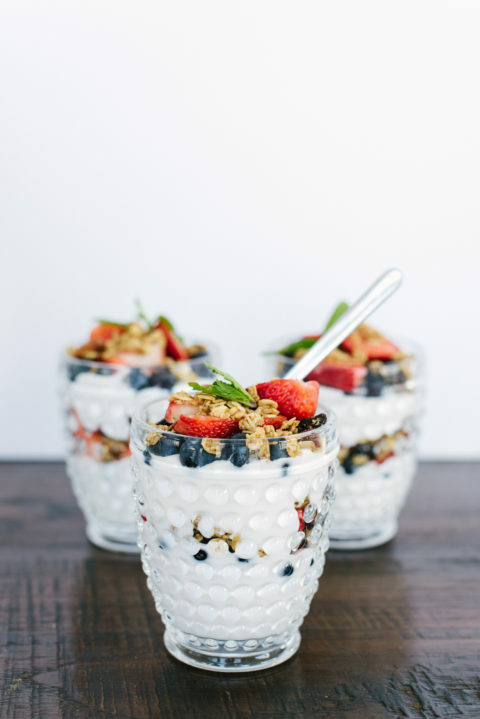 3 Serve yummy food. 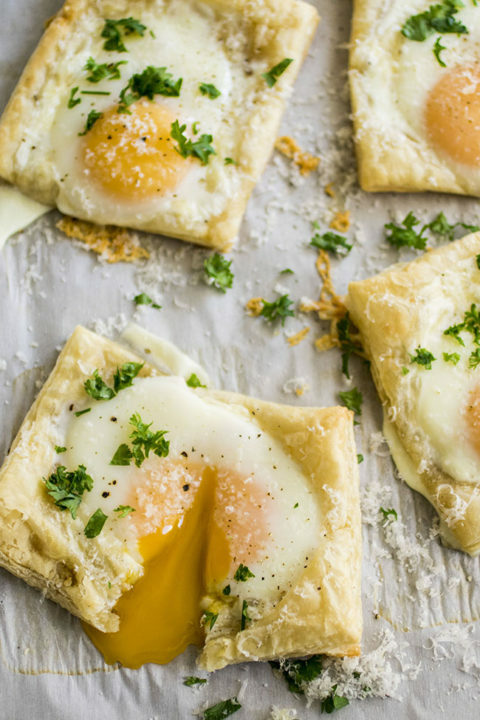 Here are a few of my favorite, no fuss brunch recipes. 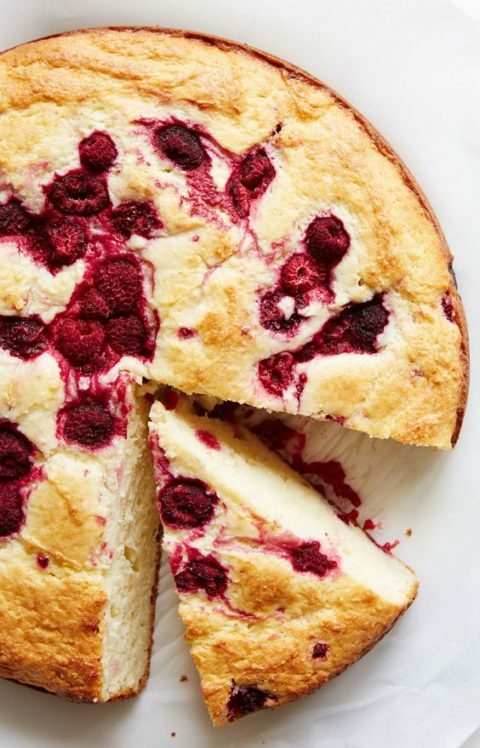 I usually make the ricotta cake the day before to save on time. Be prepared. People will freak it’s so good. Guests always love create your own mimosa bar. 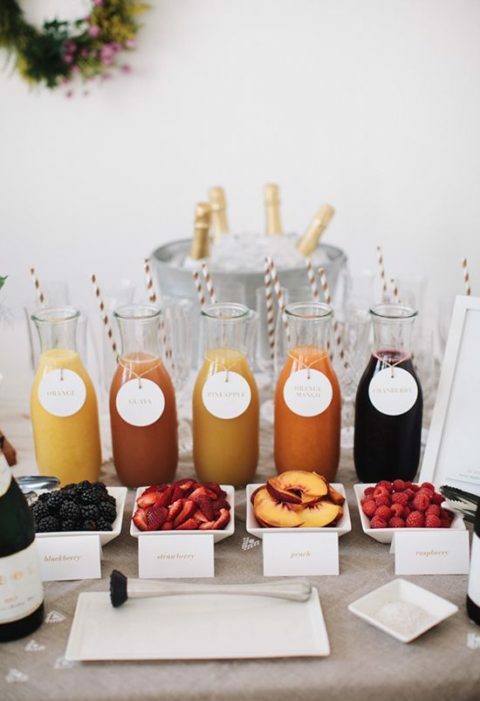 Cut up a few different kinds of fruit, provide a couple varieties of juice, and top with champagne. You can’t go wrong here. Step No. 4 Add a few thoughtful extras. At last year’s brunch, I set out a polaroid camera with plenty of film for guests to take pictures with moms and friends. I also like to get a few bud vases ahead of time so I can send moms home with flowers from the table. If kiddos are attending your brunch, set out construction paper, crayons and stickers for them to make Mother’s Day Cards. The thoughtful extras are meant to be just that, small extras. So don’t break your neck trying to get it all done. You know your guests best and what will be most meaningful to them. Go with your gut! Ok, friends, go rock that brunch! I’ll be over here cheering you on. Be realistic about what you have on your plate. Is this a crazy season of life for you? Plan for shortcuts. Serve cheese and grapes instead of the wrapped baked brie. Find the best gathering hacks and stick to them. We often procrastinate when the task at hand seems overwhelming. Be kind to yourself and keep it simple. I’ve been mulling this post over and over in my mind for weeks now. Can I be honest with you right off the bat? I’m terrified to let my work self and my mom self collide. I’m terrified to offend you or discourage you, that you might think differently of my work, or judge me as a soon-to-be mother. The role of mom vs/and the role of career is one of the most tender topics women face.